First of all, I have zero chemical background, but I seek for an easy explanation about Nano Zinc Oxide. I was told that the name of "Nano Zinc Oxide" couldn't possibly exist. Instead, it should be coined as "Nano Zinc Chelate", since an Oxide particle is quite big and Nano is so small, relatively. It sounds very contradictory. I know there is, of course, Nano Zinc Oxide, but I don't understand what he really means and I feel enthusiastic to understand it. Nano zinc oxide is a real material used in sunscreens and looks like this. 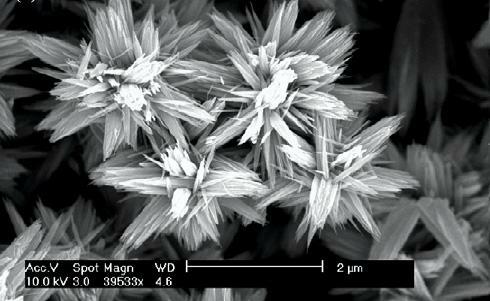 It is just little crystals of zinc oxide which are about 30 nm across. Chelate refers to something which is produced by a chemical process of chelation. Chelation means that a metal atom has more than one chemical bond to surrounding organics. (That is kind of a bad definition, but I'm trying to keep the lingo simple.) Chelation can be used to produce zinc oxide, but I don't think this is the process used for manufacturing most industrial zinc oxide. Not the answer you're looking for? Browse other questions tagged inorganic-chemistry materials nanotechnology or ask your own question. What is the difference between graphite oxide and graphene oxide? What is an 'acidic' oxide? What is a highest oxide of element? Why is zinc oxide reduced at a temperature of 1400 degrees Celsius? What are nanoparticles made of?